Heat oven to 350°F. In large resealable food-storage plastic bag, place cookie dough, flour and decors. Seal bag; squeeze to mix. Shape dough into 32 (1-inch) balls; place 2 inches apart on ungreased cookie sheets. Bake 9 to 12 minutes or until edges are light golden brown. Cool 1 minute; remove from cookie sheets. 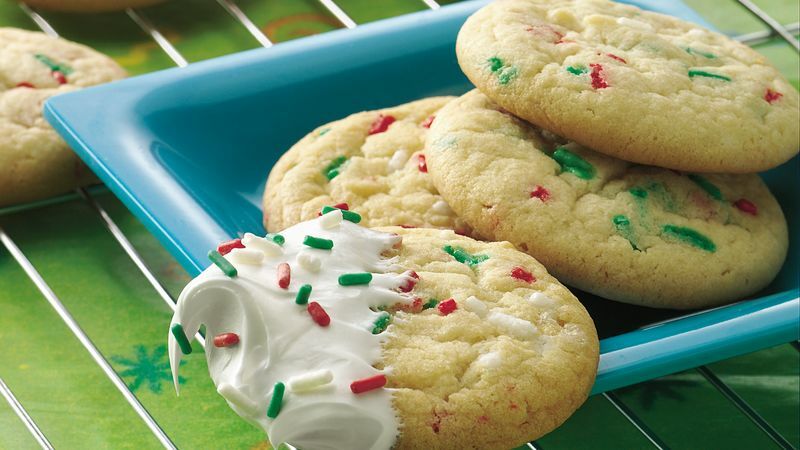 Serve cookies with bowl of frosting for dipping. If desired, sprinkle on additional decors. Swap in melts for the ready-to-spread frosting. In microwavable bowl, microwave 1 (14 oz) package candy melts uncovered on Medium (50%) 1 minute, stir thoroughly, then continue microwaving, stirring at 30 second intervals, until melted and smooth.